Piggy's Revenge : Oink Oink! Yeah, it’s on! Piggy will get his revenge for the third year in a row. Can you handle pig ruts, sugar sand, smooth sections, 3 new miles of single-track, wild animals at every turn, nice cool weather, like minded cyclists, a serious challenge to your endurance and some homemade sausages at the finish? The 3rd annual Piggy's Revenge will take place on Sunday, January 12th 2014. We will follow the same format as in previous years where you can choose between three distance options: 60, 40 and 20 miles. 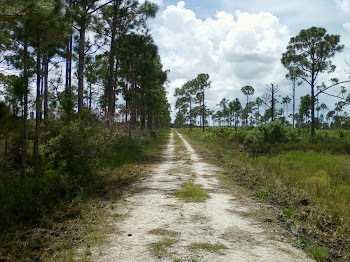 The ride will be mostly in the Mabry T. Carlton Preserve in Venice Florida and will be just as challenging as the previous years. Choose a gravel, cross or mountain bike as your weapon of choice. It’s very flat in this part of Florida but we make up for it with rough sections (think pig ruts new and old) and sugar sand. The route will be marked with painted arrows and a GPX file will be available. Early January weather can be unpredictable since cold fronts come and go but regardless it will still be a lot nicer than the other 49 States. We are planning to make the event bigger and better than former years. On a sad note the Park Managers are making us buy insurance, so a participation fee will be needed to help cover our expenses. SCORR (Sarasota County Off Road Riders) will help me with Piggy's Revenge this year. Tom is planning a water stop you won’t forget. Can Steve be beaten this year? Will the trails ever dry up? Will 12yr old Spenser return to fight the pig, putting some seasoned adults to shame? Much more information will be available as we get closer to the start date. If you are interested and have some questions drop me a note at Scorrider@gmail.com.